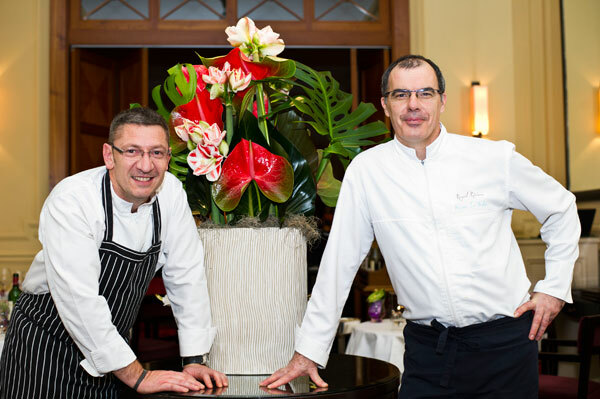 The Royal Riviera in Saint Jean Cap Ferrat is an intimate, luxurious, discreet and friendly palace, whose restaurant, La Table du Royal, offers the quintessential skills of two talented chefs, Alain Parodi and Bruno Le Bloch. Between the elegant Nice and the aristocratic Monaco, the gorgeous resort of Beaulieu attracts the international elites and fortunes, seduced by the beautiful view over the Bay of Ants and the lush peninsula of Saint Jean Cap Ferrat. 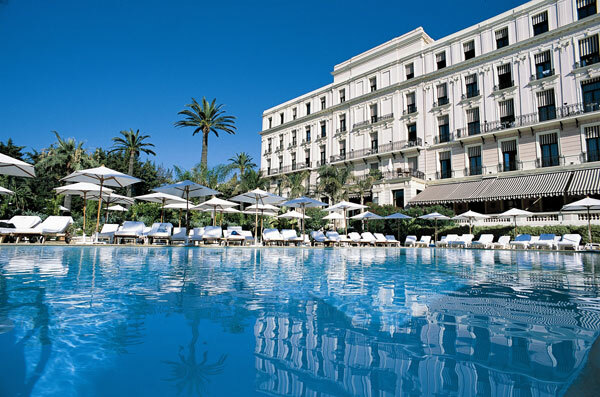 Located on the seafront of the French Riviera at both the entrance of Saint-Jean-Cap-Ferrat and Beaulieu, the Royal Riviera is one of the major addresses on the French Riviera, belonging to the luxury hospitality consortium The Leading Hotels of the World. With its palette of olive green, amber and sienna colors, the Royal Riviera is a luxurious Mediterranean mansion. 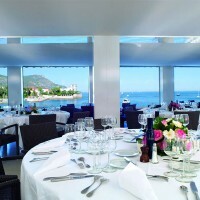 To have his customers enjoy an unforgettable gastronomic experience in keeping with its walls and the sea licking its feet, Director Bruno Mercadal has entrusted Michelin starred chef Alain Parodi with the implementation of the menu, a revisited menu, brilliantly interpreted by executive chef Bruno Le Bloch. 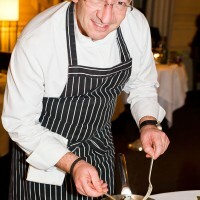 Alain Parodi, a Grassois with Italian origin, is one of the most creative chefs of his generation. 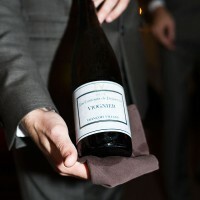 He has always transcended the beautiful flavors of the terroir by marrying them with creativity. 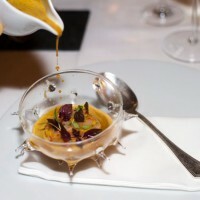 He is treating the product with passion and rigor, while indulging in his “cuisine à l’intuition.” The chef with a deep sensitivity is able to improvise on the impetus of the moment and to follow a feeling inspired by a crush at the market, an emotion, a light, achieving his tasty inspiration on the dot. 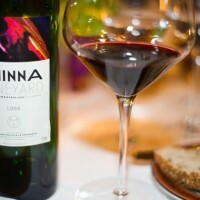 From 1996 to 2009, he made of his restaurant Le Cigalon in Valbonne a major gastronomic rendezvous, earning a Michelin star. 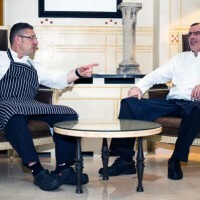 He currently lives in Greece, in Athens, where he manages a dozen establishments while overseeing the menu of the beautiful Table du Royal, bringing his creativity and energy. Bruno Bloch, born in Concarneau in Brittany, perfected his skills at the Intercontinental Hotel in Paris before entering, at the age 21, the Grand Hotel du Cap Ferrat. Later he became the chef of this prestigious establishment. 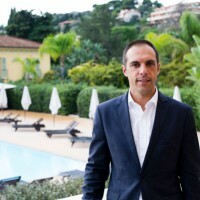 The chef of the Royal Riviera since 1994, he is a faithful admirer of Alain Parodi’s cuisine he interprets and executes masterfully. 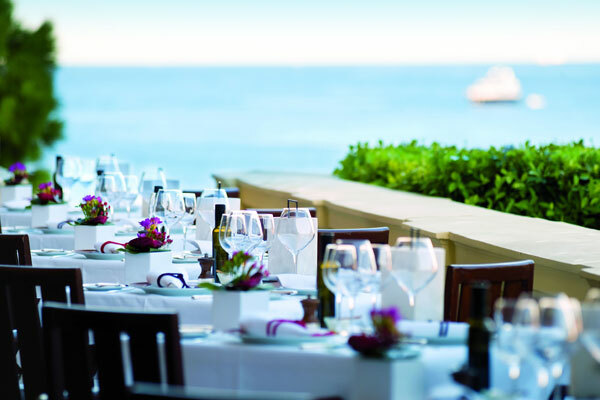 La Table du Royal has two large dining rooms facing the Baie des Fourmis. On the walls, Greek-inspired paintings remind the famous Villa Kerylos on the other side of the Bay. 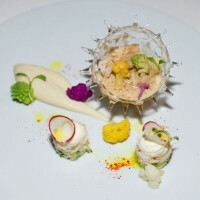 The chef duet offers an inventive, refined and gastronomic Mediterranean cuisine, a delight for the taste buds worth of one Michelin star at affordable price. All the products are perfectly cooked, seasoned and harmonized, a genuine feast for the eyes and the palate, each dish providing a nice blend of chewing sensation – spices, crispy vegetables, fine texture of fish or meat – enhancing the true authentic savors of the products. 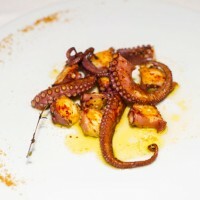 To start the gastronomic adventure, the chefs offered us to taste a piece of sea treasure, the octopus, simply snacked “à la plancha”, its crispy and tender savory tentacles perfectly seasoned with olive oil and lemon, expressing its greek inspiration. To follow, some raw cut Red Shrimp with lemon, watered with a broth of crustaceans with ginger and lemongrass. All the flavors gently explode in mouth, with a touch of exoticism, a masterpiece of harmony enhance by the chewing of raw shrimps. We stay in the sea with the crumbled crab in a pulp of cauliflower with lightly vinegared flowered heads and passion curry. 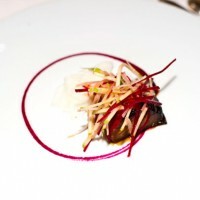 The Black Cod offers a true balance of savor between the tender and fatty flesh of the fish, lacquered with spices and complemented and enhanced by the fine acidity touch of the raw turnips – marinated with yuzu – and the beetroot and granny apple salad. 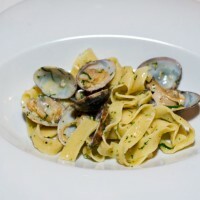 We ventured a moment into the “Menu Bistrot” and savored the delicious fresh al dente pastas Al Vongole offering an authentic Italian terroir feast. 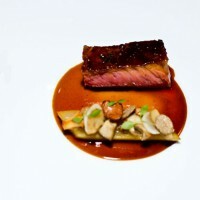 The Black Angus sirloin steak with salsify, mushrooms, chestnuts, quince pulp brings us back to the menu with its ‘jus corsé” reaching perfection. A masterpiece! For the dessert, we propose to savor the chocolate fingers with banana ice, hazelnut croustillant, Jivara mousse and lime jelly, again a perfect harmony between the sweet chocolate highlighted by the lime jelly. The Table du Royal is open daily from October to April for lunch and all year round for dinner. 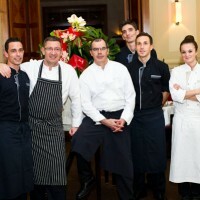 Le Bistrot menu – only at lunch – is at 37 €, one of the best price-quality ratios in the French Riviera. 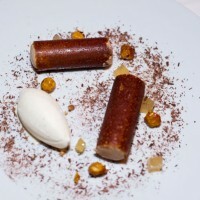 The Intemporel menu is at 61 € and the Incontournable menu is at 94 euros. 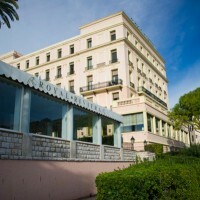 The Royal Riviera is born in 1905. 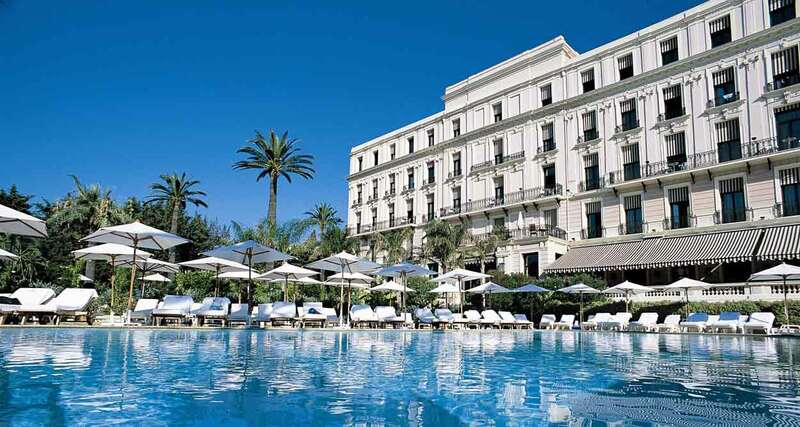 Through fashions and times, its history goes until 1999 when the architect Grace Leo tuns it into a luxury hotel with a contemporain chic inspired from the neighboring Villa Kerylos. 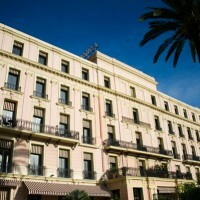 The hotel has 78 rooms and suites on 4 floors, adorned with contemporary paintings of Greek inspiration. 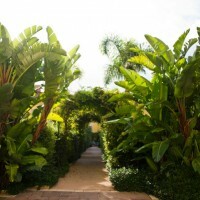 Jean Mus has redesigned the gardens to provide a dream place to let one’s imagination float peacefully in the Deck, a haven of peace in the heart of the herb garden. 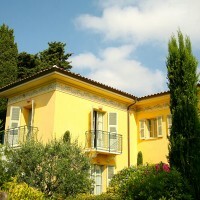 In the gardens is the Orangerie, a Mediterranean villa surrounded by olive and orange trees, offering 16 rooms and suites. The hotel proposes its customers to travel to Africa in the bar wit a zebra skin and wooden African masks on the walls. In addition to the warmed swimming pool, the Royal Riviera has its own private beach in the Baie des Fourmis.